Last week was mostly spent on improving two factor authentication support. It turned out that Firefox 57 behaves differently than Firefox 56 with U2F extension. Also it behaves differently than Chrome (which was broken as well by the way). Anyway all of these should work fine, but there still seem to be some issues with the two factor auth, but those will be certainly addressed in next weeks. Last week was equally spent on refactoring, bugfixing and infrastructure. We're looking for replacement our oldish server and it seems that rented server or virtual hosts seems to be best fit for us these days. Still there are quite some choices to consider. I've done quite some development as well - I'm most happy with Util::linkOrButton refactoring which helped to cleanup the code quite a lot, but there were other fixes and improvements as well. Last week was pretty calm, with some minor fixes in the SQL parser and several merged pull requests. 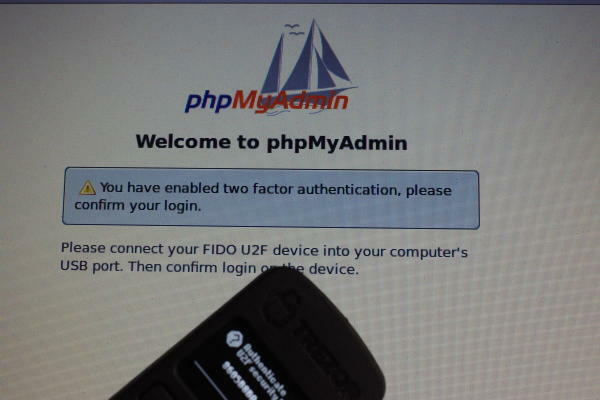 Most of last week was spent on bringing U2F and 2FA to phpMyAdmin. Besides that it was really just minor bug fixing. We've had one pull request for the 2FA already open, however it was not really in quality to be merged and the original author really didn't come back to address our concerns. I was thinking to start over from his work, but in the end I've decided to start from scratch and come with code which will make easier to implement additional second authentication factors in the future. Anyway what is now there is support for HOTP/TOTP authentication (Google Authenticator and similar) and FIDO U2F hardware tokens. The latter has been tested with TREZOR, but should work with any compliant device. #13781 Delete filtered databases deletes ALL databses ! #13784 Many messages shown on database privilege page. Last week was mostly focused on code cleanup. I've done quite some fixups in the database interface layer, which now has easier to use API and no more relies on global variables to store database links. Pretty much similar was done in the authentication layer, where many of the methods had names coming from historical reasons rather than their current functionality. #13774 Symbol "\" lost in the code editor. Last week was mostly focused on refactoring and code cleanup. This time I've worked on authentication plugins, which now fully handle authentication (previously it was partly done in the mighty common.inc.php). #13729 Differentiate between no default and empty string default. Last week I've continued on cleaning up common.inc.php, but there were other bug fixes as well. Most notable probably being fixing SQL parser to better handle CREATE TABLE queries defining partitions.